MOSCOW, Russia -- For Russian President Vladimir Putin, there are few options left in the Ukraine crisis and they all look bad. 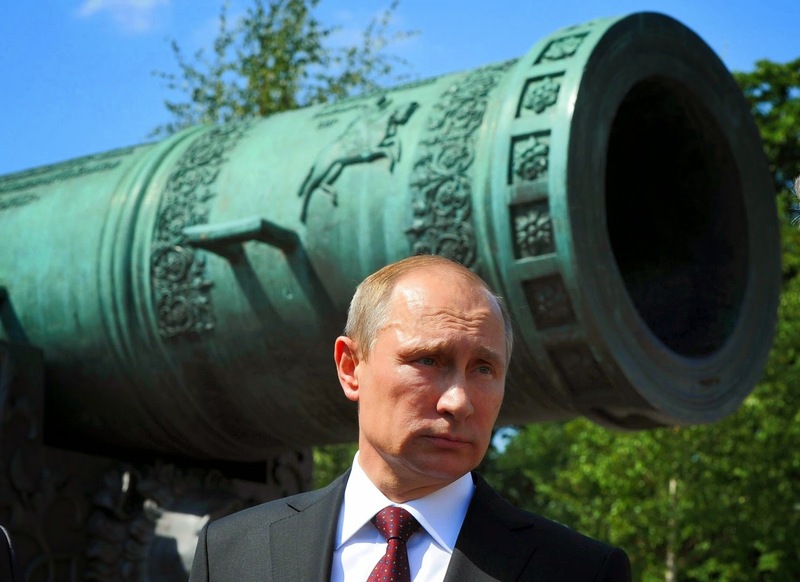 Russian President Vladimir Putin looks on during a meeting outside the Tzar Pushka ( Tzar Cannon) in Moscow’s Kremlin, Russia, Thursday, July 31, 2014. He is caught between a determined West demanding that he disavow the pro-Russian insurgents in Ukraine and increasingly assertive nationalists at home urging him to champion the mutiny and send in the Russian army. The Malaysian plane disaster this week triggered another round of U.S. and EU sanctions, which for the first time targeted entire sectors of the Russian economy, severely limiting Putin’s room for maneuver. He may be eager to sever ties with the rebels, but he would need to find a way to do so that would allow him to save face — an exceedingly hard task amid growing Western pressure. Bowing to Western demands would potentially spell political suicide for the Russian leader, who has built his popularity on standing up to the West. Under pressure, he may choose instead to escalate the crisis and risk an all-out confrontation. Putin didn’t plan for it to happen this way. Last fall, he used a combination of pressure and subsidies to prevent Ukraine from signing an association agreement with the EU and lure it into a Moscow-led alliance. When mass protests chased the Russian-leaning Ukrainian president from power in February, Putin saw it as a Western plot against Russia and quickly moved to annex Ukraine’s Black Sea peninsula of Crimea to head off what he said was the imminent threat of Ukraine joining NATO. Putin then sought to maintain pressure on the West by fomenting a pro-Russian insurgency that flared up in Ukraine’s mostly Russian-speaking industrial east in April, apparently hoping that a slow-burning conflict would help persuade the West to strike a compromise that would allow Russia to keep Ukraine in its orbit. The West, especially Europe, long showed unwillingness to take a strong punitive stand against Putin. But the downing of the Malaysian passenger plane was the unforeseen event that overturned the dynamic, and compelled the West to act. It appears that the Russian leader now is desperately looking for a way out from the crisis in hopes of containing the gravest threat to his rule to date. From the start, Putin wanted to a deal with a West that would allow Russia to maintain its leverage over Ukraine, and he has steadily tempered his ambitions. At the onset of the turmoil, Putin hoped that Ukraine would join a Russia-dominated economic alliance. When such hopes evaporated with the ouster of President Viktor Yanukovych, Moscow began pushing for a “federalization” of Ukraine that would give broad powers to its provinces and allow them to deal directly with Moscow. Rebels later backed those demands by conducting independence referendums that both Ukraine and the West declared a sham. The Kremlin then softened its rhetoric and started calling vaguely for a “dialogue” between the central government and the regions that would give the provinces a bigger say over local issues. Now with his hand weakened by the plane disaster, Putin may be eager to accept any vague deal that would allow Moscow to maintain just a symbolic degree of influence. Such a deal, however, would have to involve concessions by both parties, something that is hard to achieve amid continuing fighting and growing distrust. The West has demanded that the Kremlin disown the rebellion in eastern Ukraine. While Putin may despise the ragtag band of retired Russian officers and Moscow political consultants that have helped foment the mutiny, it would be hard for him to distance himself from them without denting his support base. The Malaysian plane disaster, however, could offer a face-saving way of publicly condemning the rebel leadership. If an international investigation confirms that the missile that downed the plane on July 17 was launched by the rebels, Putin may say that Russia can’t support those who were responsible for the tragic death of nearly 300 innocent people. Such a statement could pave the way for talks. Putin possibly fears that any concessions would only lead to more Western pressure and may choose to remain defiant. If he keeps refusing to distance himself from the rebels, the West will remain reluctant to engage in any talks. Fighting in the east, which already involves heavy artillery and rockets pummeling residential areas, will raise the pressure on Putin to intervene militarily. Putin is already facing scathing criticism in Russian nationalist publications and online forums for betraying Russian speakers in Ukraine by failing to send in the army. At some point, fearing that the damage to his popularity could become irreparable, Putin may send more weapons to the rebels. More Western sanctions will not stop his hand, but rather may push him into a situation where any compromise would look like kowtowing to the West. Pressed against the wall, Putin may even decide to send troops into Ukraine. They would likely crush the weak and disorganized Ukrainian military within days. The West would be unlikely to intervene militarily, but it would freeze virtually all ties with Moscow, sending the Russian economy into a tailspin. Living standards will plummet quickly, possibly spawning social unrest. Some in the West may hope that the sanctions will encourage members of the Russian elites as well as the broad public to demand a change of course. However, the tightly controlled Russian political system leaves little room for dissent. Billionaire tycoons, some of whom have close personal links to Putin, stand to lose a lot from Western sanctions and would like Putin to soften his policy. But hopes that they may somehow persuade the president to pull out of confrontation seem futile, as the oligarchs are too scared to form any kind of united group, and official loyalties are closely controlled by Putin’s fellow KGB veterans who dominate the officialdom. Many in Washington expected Putin’s businessmen friends who were hit by U.S. sanctions in March to push him toward de-escalation. Instead of encouraging a pro-Western opposition, more sanctions will likely further strengthen the Kremlin hawks, who may push Putin toward an even more confrontational and isolationist course. In a sense, the Russian leader has become hostage to his own propaganda that has cast the West as an enemy of Russia. Putin’s approval ratings so far have remained high, but if the economy starts collapsing under the brunt of Western sanctions his popularity would dwindle quickly. It doesn’t mean, though, that pro-Western democratic forces would have any chance to expand their presence on Russia’s political scene. Amid the war in Ukraine and Western sanctions, the weak and disorganized Russian liberals have become increasingly marginalized, while extreme nationalist forces have strengthened considerably. Economic meltdown would further allow nationalist groups to expand their sway, and Russian volunteers now fighting in eastern Ukraine may become an explosive element in a changing political equation. The prospect of potential unrest could re-ignite fears that accompanied the 1991 Soviet collapse. Thousands of nuclear warheads, smoldering conflicts between a myriad of ethnic groups, separatist movements and crumbling industrial infrastructure that could lead to technological disasters make any instability in Russia deadly dangerous for the rest of the world. Quote: "Putin’s approval ratings so far have remained high, but if the economy starts collapsing under the brunt of Western sanctions his popularity would dwindle quickly." This scenario is very likely. But the one below is a scare tactics. Nuclear warheads under tight control of the central government and no ethnic conflict will jeopardize its safety in Russia. Quotation: "Thousands of nuclear warheads, smoldering conflicts between a myriad of ethnic groups, separatist movements and crumbling industrial infrastructure that could lead to technological disasters make any instability in Russia deadly dangerous for the rest of the world." So, it is a scare tactic.